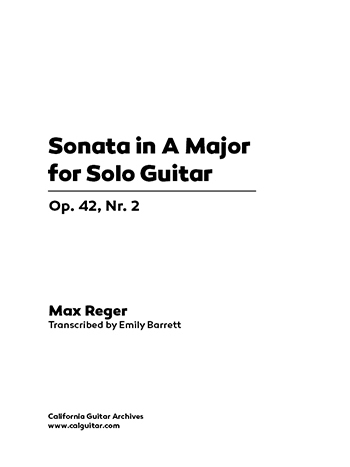 This challenging sonata, completed in 1900, comes from a set of four sonatas for solo violin by prolific German composer, organist, and conductor Max Reger. Despite his output of works and influence on the likes of Bartok, Hindemith, Schoenberg, and others, Reger's music is not widely known today. While remaining tonal, this piece juxtaposes 20th-century chromaticism against the more traditional sonata and slightly modified sonata rondo forms in the first and final movements, respectively; the overarching Allegro con grazia, Andantino, Prestissimo (Scherzando) tempo scheme is another nod to his musical predecessors. Note: The publication includes a facsimile reproduction of the original 1900 edition of the sonata.